Yves here. Public pension funds like CalPERS have been throwing money at “alternative investments” like private equity in the hope they will rescue the pensions from underfunding. This post explains the dangers of this sort of wishful thinking and depicts it as irrational. Also note that the dispersion of returns in private equity is understated due to the fact that investors acknowledge that the returns are “smoothed,” as in understate the degree of poor performance in unfavorable markets. (1) Adjust your expectations, and therefore, your lifestyle or goals. (2) Increase your savings rate. The first two options are for the realists while the third option is for the optimists. It appears CalPERS is an optimist. Board members are expected to vote on Monday to indicate whether they support the plan, which represents a dramatic new bet for the $356 billion retirement system known as Calpers. Chief Investment Officer Ben Meng has said the expansion will help the system meet its 7% future return targets. Calpers currently has $28 billion devoted to private-equity bets. 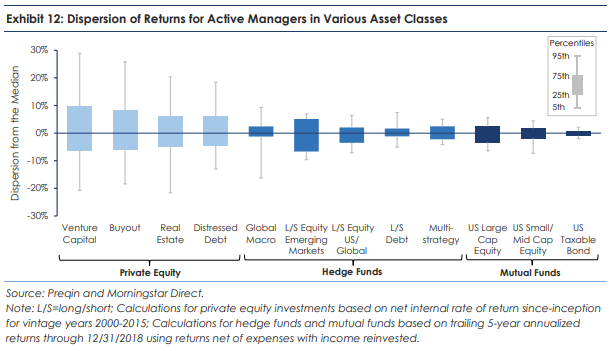 You know, private equity really is the one asset class that has a significantly higher return that can drive the CalPERS expected returns and hopefully realized returns higher. So the very first question is why private — why — why do we need private equity? And the answer is very simple. So if I could give you a one-line exact summary of this entire presentation would be we need private equity, we need more of it, and we need it now. So let’s talk about the first question, why do we need private equity? And the answer is very simple, to increase our chance of achieving the seven percent rate of return, and to stabilize employer contribution, and to help us to secure the health and retirement benefit of our members. …if you are trying to achieve seven percent return, and there’s only one asset class that is forecasted to deliver more than seven percent of the return, you need that asset class in the portfolio and you need more of it. He actually repeated the phrase “we need it now” four times over the course of this one meeting in reference to PE. There’s just a hint of desperation hidden inside the optimism. It’s possible private investments have a higher expected return but there are a host of risks involved in this strategy. Increasing risk in a portfolio can increase returns but it also increases your range of potential outcomes. 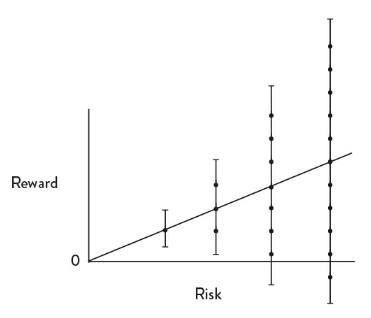 There are no guarantees that taking more risk automatically increases returns. Basically, if you’re able to consistently choose top quartile private money managers, you can earn pretty nice returns on your capital. If you’re unable to choose top quartile managers, watch out below. There’s the potential to do better but also much worse, so doubling down on risk works in both directions. When investors are disappointed with their results, ground zero for their source of frustration almost always comes down to expectations. The old saying is that stress is the gap between expectations and reality. In the investment world, irrational investor behavior is the gap between expectations and reality. It’s also worth mentioning that while CalPERS is looking to add $20 billion to their private equity book, they manage more than $350 billion in total. That’s an increase in the allocation of around 6% of the total portfolio. To put this number into perspective, let’s assume public markets achieve a 7% annual return from here over the long haul. Now let’s further assume CalPERS picks private investments that knock the cover off the ball and outperform public markets by 50%, for an annual return of 10.5%. With a 6% increased allocation to PE, that additional 3.5% in excess return would add a whopping 0.21% to the overall portfolio return. That’s 21 basis points and they need it now. When you get into multi-billion dollar portfolios it’s important to remember investment principles are often trumped by politics. My guess is this Hail Mary attempt is more political posturing than anything. It’s a way to show that the investment office is trying to do something, anything, to right the ship and improve the funded status of the pension. CalPERS is attempting to take more risk to fix their potential shortfall in assets for future beneficiaries. It may increase their returns or it could hurt performance. But they would probably be much better off if lawmakers began putting more money into the fund or adjusted everyone’s expectations by lowering future payouts. That’s not an optimistic assessment but it is probably closer to the reality they will one day face. Does Private Equity Deserve More Scrutiny? This entry was posted in CalPERS, Guest Post, Investment management, Private equity on March 22, 2019 by Yves Smith. When you are the size of CalPers, the best solution is to choose an index, and track it. It’s the cheapest, requires very little expertise, and avoids most risks (apart from the whole economy melt-down, but that’s why you chose some index). In general, the “stockpicking” is important for small portfolios. For large, the fact is that there’s only so many stocks (or assets) to pick. If Meng is hoping for a big bonus for bringing online this private equity scheme, well, if I was him I wouldn’t be putting down a deposit on a new home just yet. That whole “we need private equity, we need more of it, and we need it now” seems to indicate that the clock is ticking on this one and it has got to be a really big investment. Being from a non-financial background, I do wonder at this whole 7% return that is hyped up. Is that the real rate of return of investment hoped for? If so, it does not take into account the present rate of inflation which I believe is running at 1.5% at the moment. I suppose that you could tack on another 0.5% as well which works out to be about 100 million dollars. This would be for setting up costs, headhunting fees, bonuses, payrolls, office rents, office and IT equipment, walking-around money and whatever other fees or costs or any other dubious add-on that could be tacked onto this investment. So, you add the inflation rate and the set-up costs and that is another 2% that will need to be taken into account. If I reckon it right then, either Meng is gunna have to make a 9% return to get a real rate of return of 7% or else he will go for the 7% but that in reality will work out to be a more modest 5% of return. Those with a financial background can chip in and correct me here if I have made a blue. Something tells me that Meng is going to have a very miserable year and that he will be sorry that he ever took up a job with CaLPERS. Might have been better to take up a post with Theresa May’s staff instead. Another problem is that I can see these investments being the stone soup of the investment strategy for CalPERS. If they do even moderately well, Meng will shout that they have to put more tens of billions into these schemes while the going is good. If the schemes fail – which they will – then Meng will shout that they have to put more tens of billions into the scheme in an attempt to double down on their investments. So either way, win-win? At least any failures will never have any political repercussions. That would be disastrous for the new Governor who I am sure is also looking forward to a second term down the track. A good way for the State of California to adjust the shortfall in CalPERS benefits, which will probably be well below 7%, would be to subsidize retirees in other ways, like discounts for food and medicine, for transportation, housing, heat and electricity. Lowering expectations is a good idea, but the hardship needs to be eased until the system can absorb it all. For the State to act like CalPERS financial adventures are OK is abetting all the risky behavior. With California, and now the Midwest, flattened by climate disasters, with sea level rise, failed harvests, and trade wars – even a new housing bubble hitting California hard – private equity is just whistling past the graveyard. You can’t flip assets in an otherwise devastated “market”…. errr… country. TBTF says it all to me. Too big to manage. Needs to be broken up and re imagined. Shrink the pool of investable funds thru early payouts. Do a 1980’s Social Security style fix for future retirees. Stop the padding of benefits thru games and outright cheating. Like the mega banks with their shrinking NIM, they will struggle from crisis to crisis, while getting ever larger, never quite achieving their goals. Trying to make it up on volume. With a new round of lower interest rates upon us and a possible recession in the near future and pros stating that “low single digit returns” are to be expected for years tinkering won’t work. Something is rotten in the state of California’s pension fund. Experienced CIOs – like airline pilots and surgeons – are meant to speak with understated optimism, not in the tones of a mother onshore as she watches a large dorsal fin speed toward her child on the small yellow float. Is Marcie Frost in thrall to the chimera of high net returns that will allow her to meet her aggressive promises, or to the idea that she can avoid liability for not meeting them through the song-n-dance of opaque PE investments? Ms. Frost’s CV suggests the latter. They don’t need higher returns. They just need somebody that will promise them higher returns. That seems to be what Frost is aiming for. CalPERS will need rather more than that when it comes time to pay the piper, a can Marcie seems intent on kicking down the road. Perhaps she plans to retire by then to La Jolla, or to some location lacking an extradition treaty with the US. Thanks for your continued reporting on CalPERS, PE, and pensions. The public is being fed the Koolade that outside high-fee money managers have the “Secret Sauce” that guarantees top-quartile returns not because anybody at CalPERS actually believes that poppycock for a minute. Rather, this seemingly quixotic quest for the “Secret Sauce” provides a justification and a cover for the soft corruption of paying unconscionable fees to outside managers, who in turn grease the wheels with millions of dollars in political contributions, and soft-landing consulting gigs for former CalPERS muckety mucks. So while the composite boost to expected return of 0.21% mentioned in the article might seem tiny in relation to the added risk assumed, it might also push returns expected for audit acceptance over the finish line (7 %). Possibly, but only if one were allowed to ignore the risk associated with that rate of return. And in today’s market, unlike, say, the mid-1990s, why would an actuary or auditor accept 7% as a reasonable expectation? Maybe (certainly, actually) they shouldn’t accept an assumed rate of return of 7%. But nonetheless they will do so if it is “well documented.” The dance I describe is part of that process. And sure, actually carrying out 5he investment strategy introduces a lot of risk, but any other action would lead to lower assumed returns and higher required contributions.